Victor Salva's sequel to Jeepers Creepers further dissipates the power and mystery of the Creeper character. Remember how scary he was when you first saw him, throwing a body down the chute into his basement lair? Now he's been turned from a truly malevolent force into a grinning Freddy Krueger wannabe. Jeepers Creepers 2 pits the Creeper against a school bus full of high school jocks and cheerleaders, and the results are entirely predictable. The 2.35:1 anamorphic transfer on Pathé's Region 2 DVD is remarkably good. Most of the film takes place at night, but the scenes that take place in bright sunshine look gorgeous. The colours are often highly saturated, deliberately so, but seem natural. Apparent detail is very good, and contrast is almost perfect (making even the night scenes look clear and film-like). There is a smidgeon of edge-enhancement evident, on scenes where it would be most obvious, but this shouldn't be a problem for most viewers. The average bitrate is 5.55Mb/s. The film is spread over both layers of a DVD-9, with a reasonably good layer change. The disc offers a rich Dolby Digital 5.1 soundtrack (at 448kbps), showcasing Bennett Salvay's thunderous score. The mix is very satisfying, but not outstanding. The disc also offers a stereo audio description track (for the visually-impaired) and optional HoH English subtitles for the film only. The disc retains the film's original on-screen captions. The film is supported by some excellent bonus material, which adds significant value. There are two commentary tracks. The first gathers together most of the featured cast members (with the notable exception of Twin Peaks' Ray Wise), and is ably hosted by Victor Salva. The track is light-hearted. Salva does much of the talking, prompting anecdotes from his cast at appropriate moments. The second track, by actor Jonathan Breck, storyboard artist / Creeper concept artist Brad Parker and Makeup Effects Supervisor Brian Penikas, is also worth listening to, and adds a lot more factual information. The Behind The Scenes section is divided into six sections: The Making of Jeepers Creepers 2, Creeper Composer, A Day In Hell, Creeper Creation, Digital Effects and The Creepers Lair. Lights... 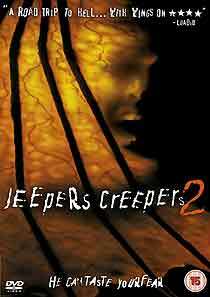 Camera... Creeper: Making Jeepers Creepers 2 (14m) is a basic introduction to the film. It begins with Salva admitting that he wrote the “every twenty-third spring...” mythology into the original film specifically to prevent a sequel being made. He reasoned that if the studio wanted to make a sequel, they’d either have to set it in the past, or in the future, neither of which would be a particularly attractive proposition for a studio. However, since the original film made a pot-load of gold (about five times its $10m budget), a sequel became inevitable. Victor Salva interviews talented composer Bennett Salvay in Creeper Composer (9m). Salvay, who also scored the original film. They discuss the differences between the two films (there’s far more action music in the sequel), and briefly touch on other issues that are rarely aired in public, including the extent of an orchestrators contribution to a score, and the use of "temp tracks" (cues from other scores, which are added to the rough edit of the film in lieu of the finished music, which the producers or director will sometimes ask the composer to mimic). A Day In Hell… On the Set of Jeepers Creepers 2 (26m) follows Victor Salva during a typical day’s shooting. It shows Salva directing part of a bus attack sequence (while simultaneously overseeing green-screen filming on an adjacent stage), making decisions on the fly, and briefing his cast and crew. Creeper Creation (11m) features the work of Brad Parker (who drew the storyboards for the film, and created the look of the Creeper) and Brian Penikas (who transformed Brad’s ideas into the Creeper as he’s seen in the films). This section shows how storyboards can be used to shape a film sequence, and how they can assist a director in shooting the film. Actor Jonathan Breck is also interviewed, and Victor Salva speculates about the Creeper’s origins (he offers the theory that the Creeper was human at one point). Jeepers Creepers 2 – The Orphanage Visual Effects (4m) is a terrific show-reel from effects company The Orphanage, showing Creeper animation tests, CGI models, and how various effects layers are composited together to build the final image. There were about five digital shots on the original film, and about a hundred and forty in the sequel (mostly, it seems, dealing with the Creeper flying). This featurette only represents the tip of the iceberg, but it’s sufficient. The Creepers Lair [sic] is an animated storyboard sequence for a scene that was cut from the film, set to appropriate music. The sequence involves three of the boys stumbling into the Creeper’s larder, as they flee from the creature. The Deleted Scenes, Moments and Lines (15m) are presented in a montage that was edited together by Victor Salva and Film Editor Ed Marx. 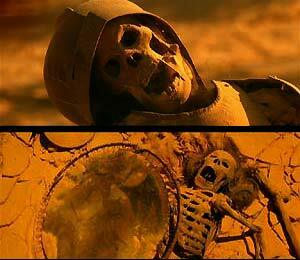 These scenes are presented in anamorphic widescreen format, and appear to be virtually complete. The audio seems rather odd, though, so it may not be properly mixed. The scenes aren’t accessible separately. There’s little of any significance here: a bit more on-the-bus banter between the jocks; a nice fleeting glimpse of the Creeper; and a rather laughable sequence where one of the cheerleaders is unable to press a button using a javelin. The most interesting sequence is a longer version of the dream sequence where one of the cheerleaders follows Darius Jenner (the young hero of the original film) into a clearing in the cornfield, where he shows her the crumbling skeletal remains of troops, who have images of the Creeper carved into, or painted onto, their shields. The bonus materials are presented in anamorphic widescreen format. They show frequent encoding and compression artefacts, suggesting that the bitrate was being heavily crunched, but they are generally of very good quality. Purists might like to note that the film has been altered since it was in theatres: Salva mentions that at least one shot has had stars added to the sky in the background for the home video release. The disc’s navigation is nightmarish - perhaps that was the intention? Not only do you get a bunch of unrelated trailers when you insert the disc, which have to be skipped individually using the chapter skip button, you also have to wait for a lengthy Jeepers Creepers II highlights clip before the main menu loads…each and every time you return to it. Also, selecting each bonus feature is tricky, because only one option is available at a time, and you have to wait for the menu’s video (light from a torch moving over the wall where the options are written) to play out to reach the one you want. The chapter menus are another area where user-friendliness has been abandoned. On most discs you’ll see a photo representing each chapter, or a short looped video clip, if the disc’s producers have made special effort. Both are excellent aids in helping the viewer to navigate their way to a particular scene. The Jeepers Creepers II chapter menus only offer titles, and often unhelpfully vague titles, too, like “Stick Together” or “Hunted”. To cap it all, the bookmark feature – if your player offers it – has been disabled, too. There are no reviews available for MGM's Region 1 disc yet, but the published spec's suggest that it will feature an additional storyboard sequence, titled Creeper Ventriloguist.